A TIME Magazine Article begins provocatively “You Now Have a Shorter Attention Span than a Goldfish”. 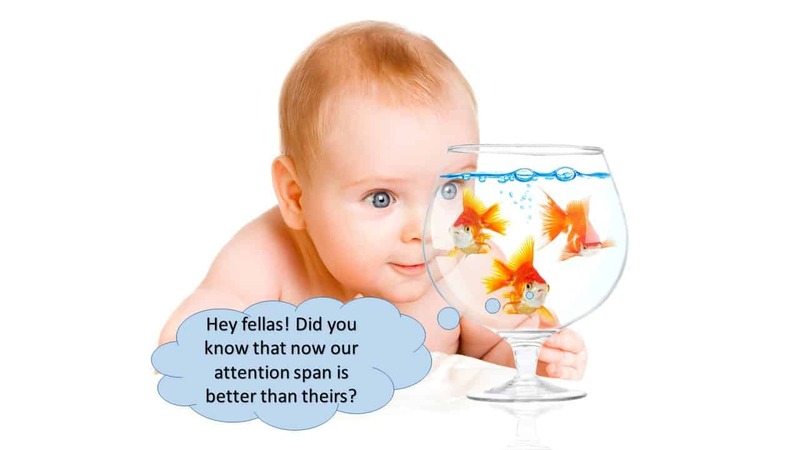 Goldfish, who have been used in insults about people’s intelligence for generations, now have a longer attention span than the average person, according to a 2015 study on the effects of electronics on attention spans. Goldfish can focus for 9 seconds without distraction – but the average human now only 8. Many point the finger at our smartphone and technology addiction. They also bemoan the effects of a digital lifestyle on our kids. Considering the attention span of the average person in the year 2000 was 12 seconds, it has dropped at a correlating rate with the increase of smartphones. But what is the larger context of our shortening attention span, and our addiction to technology? 79% of people use their smartphones while watching television – known as ‘dual screening’. The average person checks their phone 21 times an hour – just under every three minutes. 92% of teens report going online daily. 71% of teens access more than one social media platform via their smartphones. 60% of people agree that the use of technology has made their attention spans shorter. These statistics demonstrate that – especially with the younger generations – people are becoming increasingly addicted to their smartphones and social media. Even text message functions provided by mobile phones are decreasing in popularity with most teens opting for apps such as Facebook Messenger and WhatsApp to communicate with their peers. What Are The Effects Of A Shortened Attention Span? One of the biggest effects of shortened attention spans is on productivity. Productivity is so highly affected because of the omnipresence of smartphones and social media in our lives. When we try and be productive, we struggle because we’re constantly being bombarded by things which are admittedly more interesting. Ken Robinson, world-renowned education and creativity expert states that we’re living in the most intellectually stimulating time in the history of the planet. The effect of such pressing intellectual stimulation in the form of technology? Aside from all the positive things technology brings to our lives, it’s the loss of productivity which worries many. Studies show that up to 40% of time in office jobs is spent on social media and non-work related tasks through smartphones and the internet. Similarly, children find it harder to study and to finish books with lower attention spans because they’re becoming used to the immediacy of the technological world. Are There Any Benefits To The Technological Addiction Which We’ve Developed In The Past 15 Years? Yes. And lots of them. The same studies which have been mentioned in the article also mention many of the benefits which the digital revolution has brought upon us. Amongst these benefits are that young people are 97% better than those in the early 2000s at multitasking and focusing on different things at once. A common criticism is that social media and smartphones are making young people anti-social, but many arguments counteract that by stating that young people can also hold conversations, work, study, and operate in society with high functioning skills all while having the immediacy of social media and technology on their hands. Further, the ability to multi-task has also been linked to other facets of daily life notwithstanding smartphones. Our ability to give equal and divided attention to two or more tasks at once is becoming better, most scientific studies have shown. Our IQs are rising, and while 100 points is the average, this has had to be periodically adjusted from the IQ test’s initial conception as technology makes our spatial and analytical reasoning better. PhD Isabella Granic from the Netherlands discovered that video games help young people develop empathy skills, improve social relations for children with autism, and also help ease anxiety and depression along with quickening the response time to complex questions. It begs the question of whether our shortening attention spans are a necessary sacrifice in our ability to focus on more things at once, and to empathise with people in our society on a more efficient level. Technology isn’t necessarily the antagonist, it’s just a change in our society which is affecting our relationship with work, education, and others in positive and negative ways, much like many revolutions before us have – such as the industrial revolution. If We’re Concerned About Our Children’s Smartphone Addiction And Attention Spans, What Should We Do? Don’t buy an over-luxurious smartphone for your kids. Phones with internet access are important these days, but limited features aren’t necessarily a bad thing when it comes to limiting the addictive features of today’s phones. Turn off notifications for apps. The more a phone buzzes, the more likely it will be that your children will pick it up to look at it. Not using the phone’s notification features means kids will look at the phone when suits them, not when the phone demands it. Set times where the phone is banned. Make this sometime after school. 4-5 pm is a good time, as it allows kids to focus on homework and extracurricular activities. Put a ban on phone use with family and friends. Encourage your child to socialise, and don’t let them pull out their phones to interrupt being with their friends and family. Encourage kids to leave the phone in another room when it’s not being used for the activity they’re engaging in. Try role-playing with kids to help them detach themselves from their online identities. Check our articles on “6 most important types of play to your child’s development” and “8 Reasons Why You Should Encourage Imaginative Play in Kids“. You can also encourage them to go out. Organise a regular family day out once a week, and leave all the electronics at home. Indoor Play Centres such as Wannabees Family Play Town in Sydney, where role-play is the focus of our daily activities in which kids pretend to be firefighters, police officers, and doctors – along with a whole lot more, are the perfect destination venue for a fun and busy family day out. What other things do you do at home to keep your children away from electronics? Do you agree with the results of the study where they blame the shortening of our attention spans to smartphone usage? Please share this article with a friend and let us know what do you think by leaving your comments below.